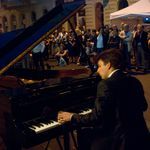 From 8 am until midnight on June 21, 2014, and at over 130 locations across the city, the people of Budapest, former and current yellow-star house residents, survivors and their families, friends and neighbors, theater groups, musicians, authors, civic groups, public figures, cultural institutes, and embassies held commemorations marking the 70th anniversary of the forced relocation of Budapest Jews into the yellow-star houses. We estimate that at least 7-8,000 people took part on this memorable day. On behalf of OSA Archivum, the initiator of the Yellow-Star Houses project and, in all likelihood, with the agreement of many thousands of Budapest residents, I would like to express my thanks for the profoundly moving day. After June 21, 2014, the tragedy of the yellow-star houses’ residents has now become an integral, undeniable and permanent part of the city’s history and memory. Only 70 years on did we comprehend that there are still those among us who witnessed and remember these events, whose experiences and suffering substantiate our shared history. Budapest came alive with commemorative events planned and held by the people of this city. From this, we can all conclude that it is simply not enough to protest when the powers that be try to use, abuse and falsify the facts of our shared history for political ends. It is up to us to remember, to understand and to comprehend the past: this is our shared moral, civic and human duty. Our shared history, and thus this city, are ours.